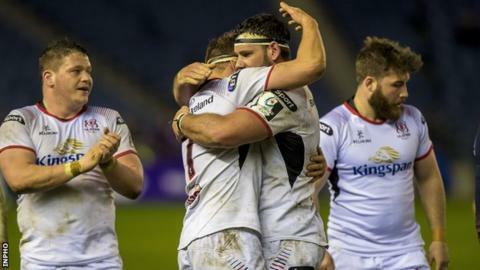 Ulster assistant coach Dwayne Peel says securing a home Pro14 quarter-final is just reward for "a massive effort" by the Irish province over recent months. Ulster's 29-7 bonus-point win at Edinburgh, coupled with Munster's 37-28 victory at Benetton, ensured Ulster finish second in Conference B.
Ulster are back in the Pro14 play-offs after a two-year absence and will face the team that finished third in Conference A, Irish provincial rivals Connacht, at Kingspan Stadium on the weekend of 3-4 May. Dan McFarland's team are also assured of a place in next season's Champions Cup. "We were hurting on the Monday after our monumental effort in the Champions Cup quarter-final against Leinster and we couldn't produce the goods against Glasgow last week," said Peel. "It was all about us coming to Murrayfield and performing and winning. We knew if we did that we would be in the play-offs and we are delighted. It's fantastic. "Everyone put a massive effort in so I'm pleased for the boys. From the last few rounds in Europe to what we have achieved now - the last couple of months have been good." Man-of-the-match Iain Henderson put in a typically barnstorming performance as captain of the side and Peel also credits Ulster's "stern defence" as being crucial in the outcome of the encounter with Edinburgh. "Iain was brilliant. He leads the team really well in terms of talking on the pitch," said the former Wales scrum-half. "There was a period of eight minutes in the first half where we turned the ball over three times in their 22 and I thought 'I hope that doesn't come back and bite us' because we put them in good positions. Former Ulster and Ireland back row Chris Henry on BBC Radio Ulster: "For this Ulster team to go away from home and get a bonus point - to grab the tournament in their own hands and have a home play-off to look forward to is great. "We are certainly contenders to do something in this competition and whatever team is going to have to come to the Kingspan Stadium and play in those knockout stages will have their work cut out. It's going to be really exciting. "Dwayne Peel will be delighted with the back-line but for me it was all about the pack in that win over Edinburgh - the work-rate, the desire, the physicality that we brought. "The forwards were relentless and gave us a really good platform to put in a really confident performance."